Do you fell like you need to wind down ? Slow up and get some air ? ​Welcome to « Massage et Nature », in « Champ-du-Moulin », in the middle of a wild life reserve, the « Creux du Van » where ibex, chamois and marmots wander free. The Creux du Van is a natural amphitheatre of rocky cliffs, more than 500 feet high, between the cantons of Neuchâtel and Vaud. Feel like something refreshing? A walk in The Gorges of Areuse are a must. The Areuse has its source in Saint-Sulpice, and follows a peaceful flow until reaches Champ-du-Moulin. From then on , it throws itself into dramatic gorges, all the way to Boudry, then flows into lake Neuchâtel. After this majestic walk, ease off in front of a fire place. 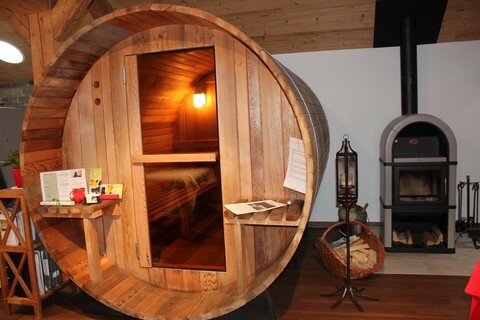 Sauna and Jacuzzi are at your disposal for relaxation. Unlimited acces to the sauna and Jacuzzi. ​Reservation required at 078 / 621.21.28 minimum 24 hours in advance. Payment are recommended in cash. If paying by credit card, a 3% surcharge will be charged. Nature, simplicity and respect are words that came to our heads and hearts. If you feel like it, you can also get a therapeutic massage (not-included). By car: from Neuchâtel, take the road to Val-de-Travers exit left Champ-du-Moulin, through the forest, then right, towards Champ-du-Moulin Dessus.